The cafe racer, reinvented, Special Edition style. Triumph is introducing a special edition to its cafÃ© racer-styled Thruxton, giving an even sportier look to the classic British design. 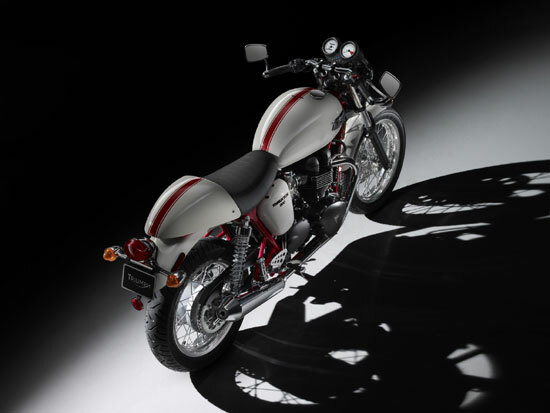 The 2010 Thruxton SE debuts a stunning powder-coated red frame and Crystal White bodywork with red stripe, color-matched fly screen and blacked out engine cases. The new Crystal White paint contains a high metallic content that results in a luxurious paint finish, and creates a striking contrast to the dramatic red frame. The Triumph Thruxton features state-of-the-art design and performance combined with a distinctively retro design. The fuel injected 865cc parallel twin is the most powerful of Triumph’s Modern Classics range, delivering 68bhp at 7,400rpm and peak torque of 51ft.lbs. at 5,800rpm. The engine shares the same 360° firing interval as the Bonneville, but also features ‘hot’ camshaft profiles, a compression ratio of 9.2:1, and megaphone style pipes. Sporty, low rise bars, 18 inch spoke wheels, megaphone style pipes, and a race inspired stripe from tank to tail evoke memories of the Ace CafÃ© and racing in the streets. 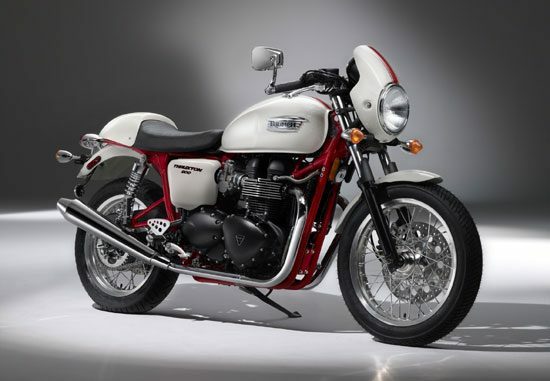 The Thruxton SE will be available at authorized Triumph dealers throughout North America in the spring of 2010. Prices are still to be confirmed but the SE model will come at a small premium over the standard Thruxton. Named after the famous racetrack where Triumph ruled the roost. Inspired by the Ton Up Boys of the 1960s. The Thruxton is Triumph’s sportiest Modern Classic, and authentic cafÃ© racer delivering a unique Triumph experience. Low rise bars, a sporting riding position, 18” spoked wheels, megaphone style silencers and a race inspired stripe from tank to tail evoke memories of the Ace CafÃ© in racing in the streets, but underneath the engineering is pure 21st century, with a clean-running fuel injected 865cc parallel twin engine tuned for more performance and modern day reliability. The chassis too brings modern handling and braking thanks to adjustable 41mm forks and a 320mm floating front disc brake gripped by a twin piston caliper. It’s a motorcycle to stir the hearts of those who remember it first time around and for young riders looking for that authentic retro experience that only Triumph can deliver. The Thruxton Special Edition comes complete with blacked out engine cases. The Thruxton Special Edition has an eye catching red powder coated frame. The Thruxton Special Edition debuts stunning Crystal White bodywork with red stripe. A colour-matched factory fitted fly screen adds to this bike’s sporty look. The Thruxton Special Edition decals have been designed specifically to complement the bike’s overall scheme. MSRP £6,699 OTR (price effective from 1st Jan 2010), Price £7,099 OTR. Production of the new Triumph Thruxton Special Edition commences in early 2010. £6,699 OTR (price effective from 1st Jan 2010), Price £7,099 OTR.